Tilt rotor or tilt prop, two rotors or one . . . the combinations for vertical takeoff and landing (VTOL) vehicles run the gamut. Here, a layman’s look at why Airbus is developing the RACER high-speed demonstrator, and how it works. Airbus Helicopters is nearing the end of its development phase on a unique research aircraft, the RACER* technology demonstrator, that will ultimately be used to demonstrate mission configurations. 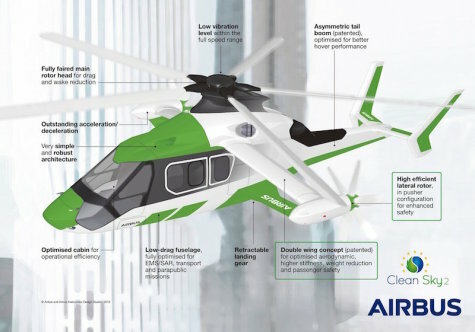 The company – working with 40 partners in 13 countries as part of the European Clean Sky 2 project – recently submitted key subsystems of the demonstrator to a preliminary design review and will begin manufacturing its first components. The final assembly of the RACER prototype is expected by the end of 2019. Aeromechanical engineers have long grappled with the challenge of making a vehicle able to take off vertically, hover, and achieve very fast cruise speeds—an almost-mythic combination of lift and forward thrust. But making one that is affordable and multi-mission . . . that is another matter. Advances in the field of V/STOL** aircraft have given rise to scores of variations. Many models succeeded in experimental stages, some achieved production status—most at a significant cost or for a limited market. Airbus Helicopters’ RACER demonstrator aims to go further, by showing that its particular combination of rotor, box wings and lateral propellers is the answer to cost-efficient, fast flight. So, what distinguishes RACER’s architecture from other designs? The basic formula for a helicopter is that it have a main rotor and tail rotor. Engineers know the limits of this formula in terms of speed. “The only way to fly faster is to add either a wing or a second rotor, and propellers to increase the speed,” says Paul Eglin, senior expert at Airbus Helicopters, and the aeromechanics task leader in the RACER project. If you want an aircraft to hover, nothing is better than the large diameter of a rotor. But in cruise, the rotor is limited by its aerodynamic behaviour: at very high speeds, through a combination of the rotation speed and the vehicle’s forward motion, the tip of the advancing blade reaches the speed of sound (Mach 1)—a critical point that affects the aircraft’s ability to maintain lift. At the same time, the retreating blade compensates for its lower speed (compared to the advancing blade) with an increased pitch angle, until it reaches the point of stall (loss of lift). RACER’s two propellers are mounted on box wings—think of very thin, sleek biplane wings joined at the tips by the propellers’ bullet-shaped casing. The wings attain good cruise efficiency, and have a small surface area above to minimise their interaction with the main rotor wake when the aircraft is in hover. The propellers are two lateral “pusher” types. In addition to providing thrust for high-speed cruise, they counteract the main rotor’s torque effect in hover, thus replacing the role of the tail rotor. In hover, the asymmetric tail boom benefits from the interaction from the main rotor wake to provide a significant contribution to the anti-torque function as well. The underlying philosophy behind RACER’s design was simplicity. “When we speak about future products, it is important to develop things that are simple and robust,” says Tomasz Krysinski, Head of Research and Innovation at Airbus Helicopters. This simplicity is illustrated in RACER’s transition – or lack thereof – when moving from hover to cruise. When the aircraft is stopped or cruising at slow speeds, the main rotor is responsible for lifting the aircraft. As speed increases, the wings then begin to progressively take over the job of providing lift, as they do in a standard fixed-wing aircraft. The pilot just has to reduce the angle at which the main rotor blades are positioned to maintain a constant altitude. For propelling the aircraft forward, a similar shifting of the burden takes place: as the main rotor propels the aircraft forward, the lateral propellers take over as speed increases. It all happens in progression, to the end benefit of the pilot at the controls. “With RACER, we were guided by the search for a simple design because this results in an intuitive way of piloting, it’s safe and stable, and there is a lower cost in applying maintenance,” says Krysinski. An aerodynamic shape, lightweight materials, and equipment integrated in a streamlined manner - plus a myriad of tweaks and optimisations - make up a vehicle that flies 50% faster than conventional helicopters. This translates to potential big changes for operations like EMS, where the greatest chance of saving patients’ lives depends on getting them to help within the first “golden hour” of need; or search and rescue missions where a faster arrival on scene allows crews more time to effect a rescue. --**V/STOL: vertical and/or short takeoff and landing.